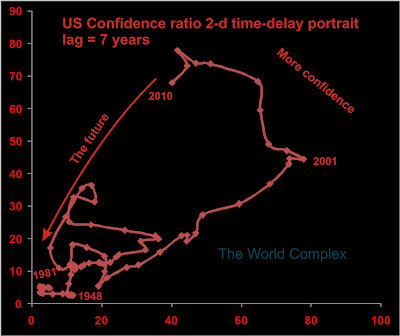 Today we look at a graph of confidence in the US system. The US confidence ratio represents the ratio of outstanding US Federal debt to the dollar value of US gold holdings (as reported*). No corrections for inflation should be necessary, as both terms are valued in the same depreciating dollars. We use the term confidence as the ability of the US to stretch this ratio to (by our thinking) absurd multiples was a reflection of the world's confidence in the United States--which differs from the ability to actually repay debts. For post-1971 I used the assumed holdings of 250 million ounces multiplied by the average annual price (from Kitco). There are those who suggest the true holdings are substantially less than 250 million ounces. That may be so, but the picture is already bad enough if we accept the official numbers. Confidence level sank throughout the Depression up until the beginning of WWII, after which ascendant American power was reflected in a climbing confidence ratio up to the oil crisis in the early 1970s. Confidence sank as the US withdrew from Viet Nam and inflation rose until the price of gold rose sufficiently to restore confidence in American solvency. From 1980 to 2001 was a golden age for the US. In this time, both stock and bond markets were strong, the US currency was strong, and the only credible opposition to US hegemony disintegrated. But every bubble meets its pin, and ever since the planes hit the towers, the US power and prestige has gone into decline. This decline is marked by a rapid decline in the confidence index. How low will it go? There is a provocative looking left shoulder and head, suggesting a drop to the neckline somewhere around 2020, after which there may be something of a resurgence in American confidence. The anticipated completion of the bankruptcy head-and-shoulders formation promises to be a hair-raising event. Actually, though, what appears to be happening is the blowing of bubbles. A bubble is blown, but can only expand so far before confidence fails and the bubble deflates. Then another, in this case larger, bubble is blown. If the bubble is able to deflate without society collapsing, perhaps it will be possible to blow another. Or perhaps we will be wise enough to act in ways that prevent the bubble from being blown in the first place. At the World Complex we are of the opinion that bubbles are bad--but we recognize they can be a lot of fun. Sort of like going on a bender. The US has been on a bender since 1980. Soon the weekend will be over and it will have to be back at work. Although the new boss may be of the Asian persuasion. For the bubble to deflate, the debt must disappear, or the gold price must rise. Assuming no change in debt levels, the gold price would have to rise about ten-fold for the confidence ratio to fall to historical values. Unfortunately, a considerable rise in US debt appears to be baked into the cake at this point, so we would foresee gold to eventually reach breathtaking prices. On this chart we don't dare suggest anything other than a fall towards the origin of the graph. If the ratio falls to 10, then gold has to rise to about $6,000 per ounce at today's level of debt. If the ratio falls to 5 (the last low in 1980), then gold would have to be about $12,000 per ounce (again, only at the present debt level). The numbers could be quite astronomical once the deficits in Medicare and Social Security start being realized. I enjoyed your use of phase space in economic analysis. For more of that approach, I encourage you to look at my work on the Phase Method in analyzing economic cycles at www.investmentmeasures.com. Sorry for the self promotion but I think the work is good and also you may find it interesting. Dare you to look at it! Ya, ok, you could be nuts? I would love to see a follow-up post applying the same confidence ratio to some other countries like England, France, Japan, Russia, Germany. Does the confidence ratio appear to have explanatory value for other countries? Do you use the market value of debt or the face value? Actually I used face value. But I could see with many countries it might be wiser to use market value, if it can be established. Can HFT hold up the market? Flash crash: business model or indicator?